Processing in the agricultural sector, IT, logistics, engineering and tourism are priority areas for investment and government support in the medium term, said President of Ukraine Petro Poroshenko. "We have several areas in which it is worth investing. The first is the agricultural sector ... in the processing industry. The agricultural sector should export products with high added value," Poroshenko said at the 15th Annual Ukraine Investor Conference organized by Dragon Capital in Kyiv on Tuesday. The second direction, the head of state said, is the IT sector. "Already today, 150,000 people are working in the IT sector ... But, I emphasize, this number will grow, and in a year and a half the number of employees will increase to 200,000," he said. In addition, the president noted the importance of using the favorable geographical position of Ukraine. "We will definitely develop Ukrainian logistics: ports, railways, creating unique transit opportunities. And these investments will definitely be reimbursed," he stressed. Other state priorities are attracting investment in engineering, the development of new technologies, and the development of tourism. "On average, the world tourism constitutes 10% of GDP, and we still have 1.5% of GDP. 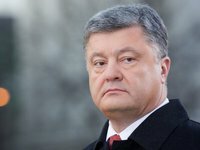 My goal and my task for the next five years is to bring the number of tourists to Ukraine to 30 million people," said Poroshenko.